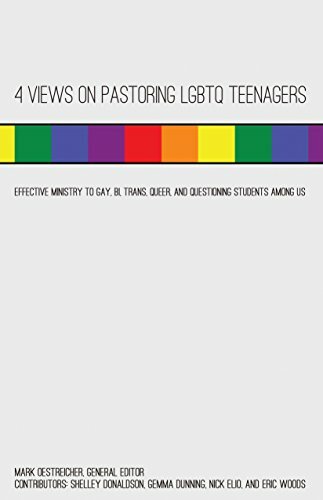 That is the bold confident claim and dream in the recent book ‘4 Views on Pastoring LGBTQ Teenagers’, by the Youth Cartel, that includes contributions in this edition by Gemma Dunning, Shelley Donaldson, Nick Elio and Eric Woods, this is my review of this piece of work. There is much to be commended in this book. Though in one sense, the writers readily confess that their four views share a whole lots of commonality, three of the views are from a US perspective, all bring to the table personal and/or professional experience of shared lives and practice with young people, some of whom would identify as LGB or TQ, and each of their views brings together the realities of how this experience of young people affects parents directly, churches and also the specific dynamics of groups of young people in church activities. What the contributors share also is that there is a complexity to trying to ‘work’ out a particular standpoint, perspective or set of coherent statements to this concern that they have and share with us. The contributors recognise the complexity of trying to juggle what appears to be the conflicts within the theological position of conservative evangelical youth ministry and churches, with ecclesial politics and also the lived experience of young people growing up in societies in which they as LGBTQ identified need to be given an abundance more of intentional inclusion than other young people. As I say there is much to be positive in this book, and I mean this, its not a prelude to a long ‘but’- This is a detailed if not personal exploration of how four people in Ministry came to revelations about the faith, their practice, the world of young people and their struggle, challenges and culture doing so in christian ministries that caused them to have to dig deep, make sacrifices and begin a process of education and change within churches (that they were employed within) to enable young people to receive the kind of welcome, support and space to be that their dream for every LGBTQ young person might need. If you want to be a church community that has the desire to offer this kind of welcome and space for young people – then this book is for you, as there are many practical tips, and also pointers to the challenges that this might bring, especially in terms of trying to gain consensus on a particular view of LGBT (and if even Consensus is what is required). As they say, though, dont try and be inclusive if you dont mean it, and arent prepared to be it. I specifically enjoyed that when churches say ‘All are welcome’ some who identified as LGBT may still want to know if they are included in the ‘all’ – and so without having to make an extra phone call to the church office, the church should go out of its way to specify that it a welcoming space for those in the LGBT community. It would be simple thing to say, but might need considerable conversation so that a church might mean it. This is one practical tip, there are others, that specifically relate to young peoples activities such as residentials and small groups, all of which might give reason to not know ‘what to do’ but each is given due mention in this book, and ultimately many of the issues that might be raised are solved through respecting all young people and giving them all opportunity to contribute to how a situation might be ‘resolved’. This ultimately is good youthwork practice. It is ‘this good youthwork practice’ that leads me to the ‘however’ of this review. Why are you still talking about this? As if the world and her have moved far on, but the church is still having to continue having conversations about this issue. The conversations itself that highlight that the complexity that the church might face in the ongoing to act meaningfully and inclusively with young people in the way the writers dream for in this book. But for youthwork in the UK, (not youth ministry) this conversation is a non-starter, there have been LGBT groups, conversations and friendly spaces for years, the LGBT youth clubs in Scotland have been active a long time. Because it is inclusion and anti-oppression first – (without conservative or evangelical theology in its way). It is telling that youthwork/informal education is absent in the US youth ministry context and conversation, and it is sadly absent in this book. But for youthworkers there is a sense that why are we talking about this? – its 2018 for crying out loud. On the other basis – No one has been talking about this as nothing has been in print on this concern, within youth ministry. It is the ongoing voice of young people that is however sadly lacking in this book. Some of these stories are painful, some are brave and some complicated. But this book has alot of is the voice of youth leaders who are shaping ministries, churches and lives to accomodate and be inclusive to LGBT and all young people. It is a shame therefore that the table is not extended to hear directly from LGBT young people themselves. We hear statistics of LGBT young people and recommendations of churches to young people, but it is their voice that is absent. There is not a story of how LGBT young people have found the desired welcome in a church. It is a minor thing, on one hand as there are not many youth ministry books that include the actual voice of young people, they tend to be the cumulative experience of youth leaders and academics. But a personal story and one from an LGBT young person in this book about inclusion might have been helpful. Churches should be the most safe place for young people to ‘be’ LGBT. I wonder. This might reveal that youth leaders feel that other spaces arent safe. I would say in the UK that there are inclusive spaces for young people to ‘be’ LGBT are common and a church is lower in the pile that a young person might go to. However, a young person who has grown up in the church who identifies as LGBT at a time during their child or teenage years, needs to know that the relationships they currently have with supportive adult in their christian upbringing are going to stay the same when their LGBT identity is known. If the church is serious about being with and for young people, then this dream has to be a reality. If you want tips on churches being safer places for young people to be LGBT then this book is for you. If you want to use it to start a conversation that should have already been had, then use it, If you want it to have all the answers and something concrete for you in your situation then its not for you, there is much to be worked out in each situation, and much to i think do in order that churches might live up to the dream of being safe that this book aspires churches to be. Though- better to start a conversation about this, than only react later. Youth Ministry and Discipleship for ‘Generation Non-Religion’ – what needs to change?